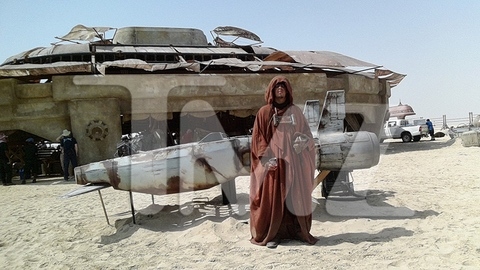 Exclusive: Star Wars: The Force Awakens’ Two “Main Street” Speeder Designs! I was sent these two pieces of speeders which were designed for Star Wars: The Force Awakens‘ “Main Street” set. As these were kind of hard to describe, the source said to share them. I believe both of these speeders were put together in Abu Dhabi, however, these were intended to be constructed in Jordan originally. These are just background speeders. 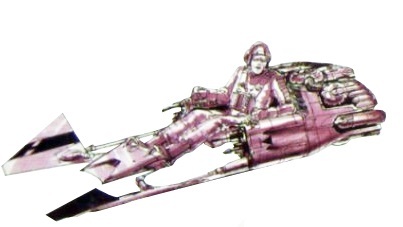 I also saw many more designs for Rey’s “Wagon Speeder” (my term). There is a shot where Rey zooms across the sands in a speeder with a flatbed in the back. Finn is in the rear, hurt, and BB-8 is laying on its side, along for the ride. In each different piece the front of the speeder is slightly different and in some the fins on the back are changed. Some were just edited versions of the same drawings. Interestingly, the fins and the front are slightly different in this iteration above than in the concepts.